I had a request for a How-to on this, so here it is. This first post is just the basics, though. The loom, how to warp it, how to weave on it. 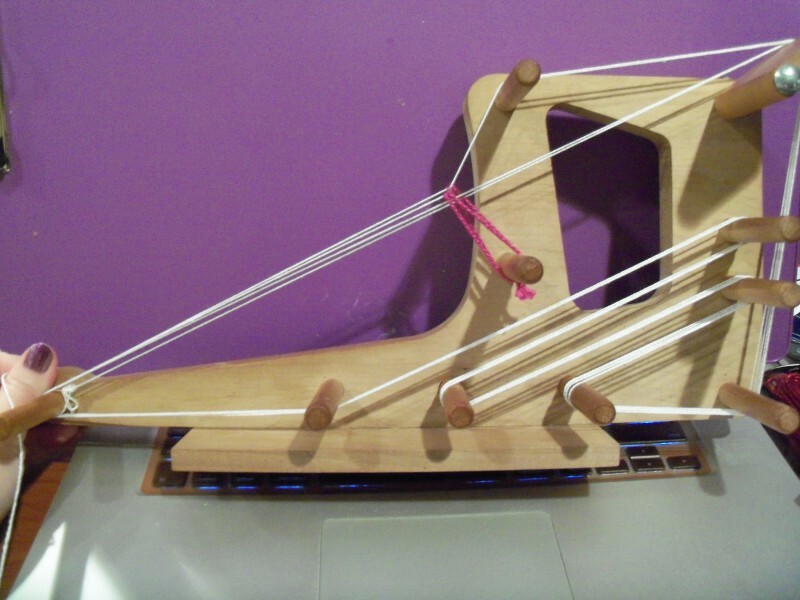 This is an inkle loom. 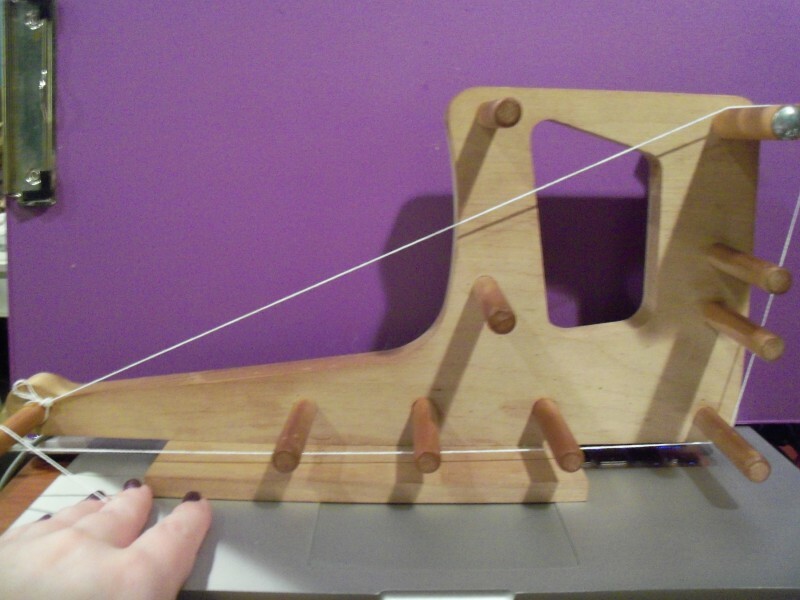 An inkle loom standardly has a bunch of pegs to wind the threads around, including one to hold the string heddles, plus something to adjust the tension with. 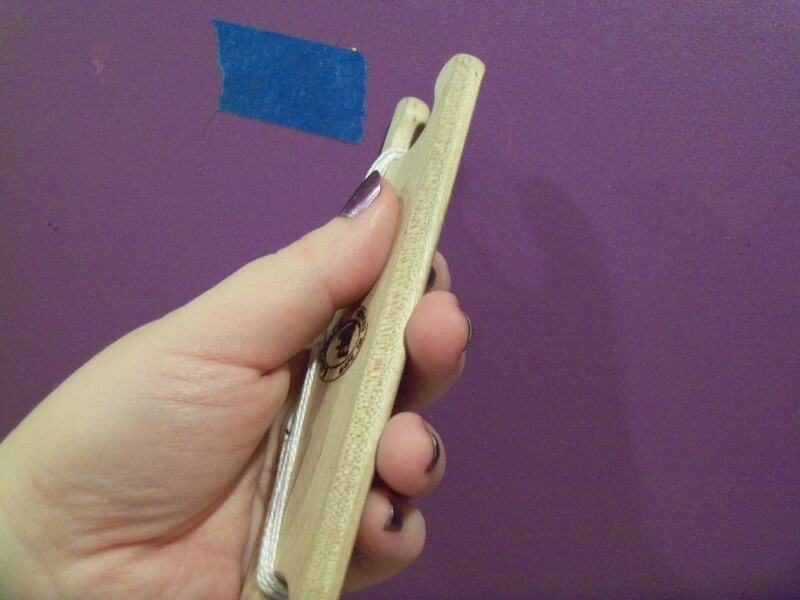 A lot of inkles have one peg that can be moved along a track. This one has a flap that swings around. Here are the other things you'll want in order to weave a Baltic pickup band, minus one thing. 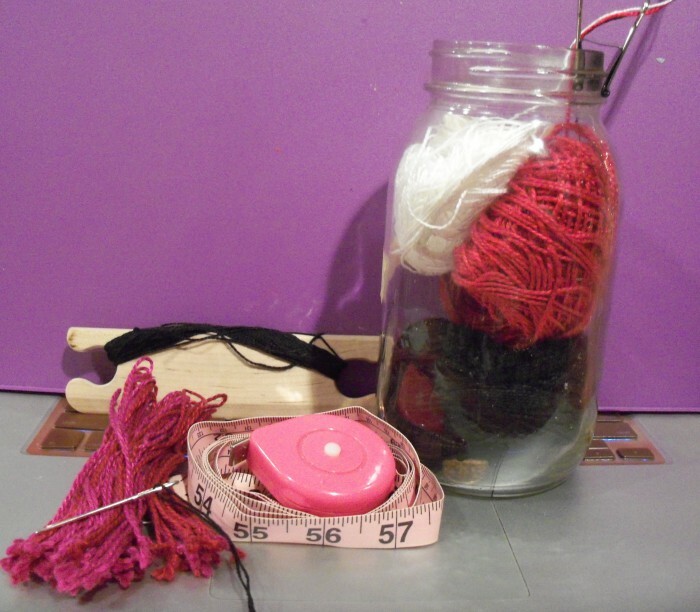 Here we have yarn in three colors (pattern, background and accent), tape measure, tapestry needle, string heddle, and belt shuttle. What's missing is a pickup stick. A pickup stick is about two inches wide, between an eighth and a quarter of an inch thick, and has a flat tapered end. 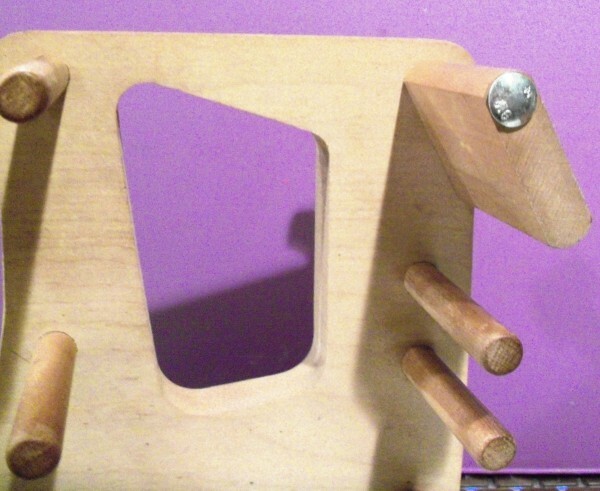 You use it to pick up pattern threads and hold them in position. 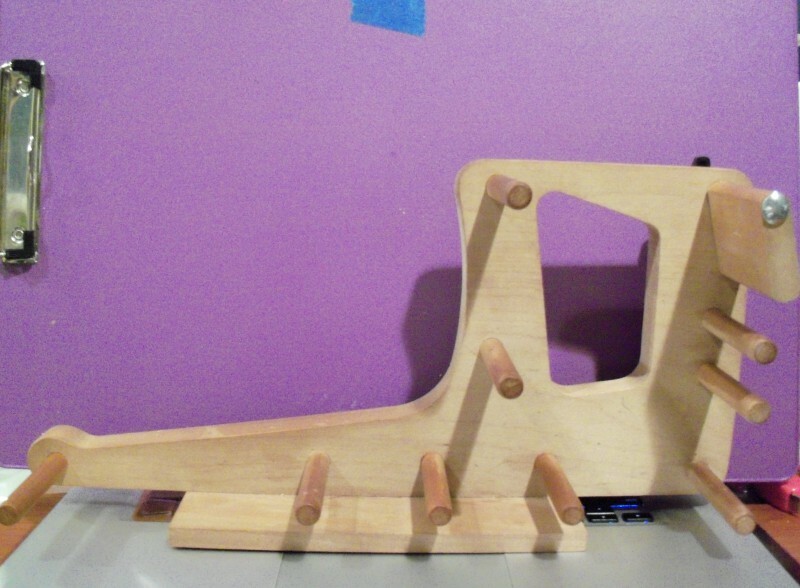 The only one I have, and it's 18" long, which is a pain to work with for this. 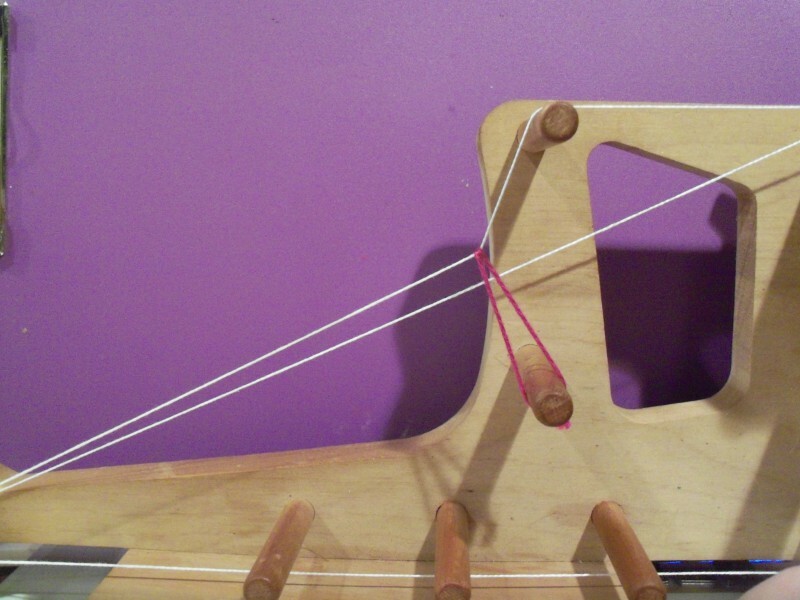 This is a string heddle. A heddle is anything used to raise or lower sets of threads during weaving, or to hold them still while other sets are lowered or raised. 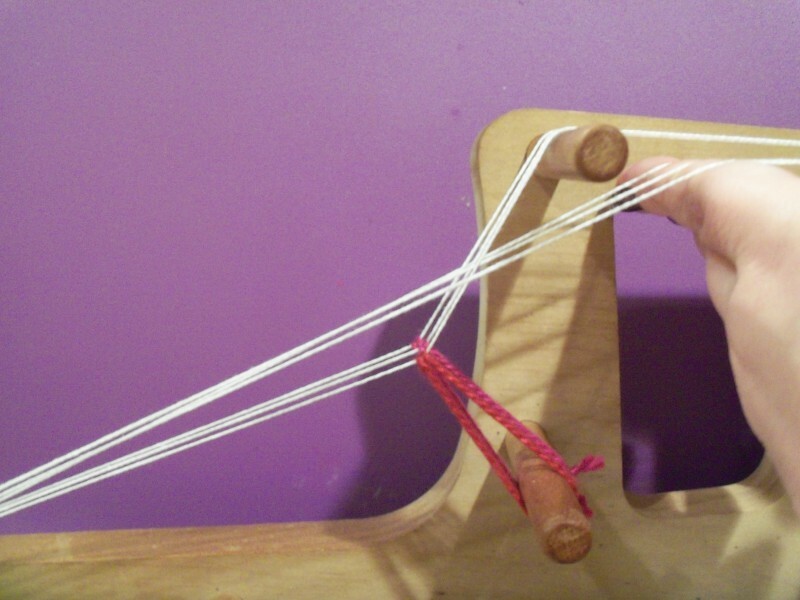 These string heddles are looped from the heddle peg around every other thread of the band. The other threads, called open threads, are then manipulated. This is a belt shuttle. Belt shuttles are small shuttles with one blunt edge that yarn or thread is wrapped around and one tapered edge used to beat the weaving. Warping the loom! My least-favorite part. 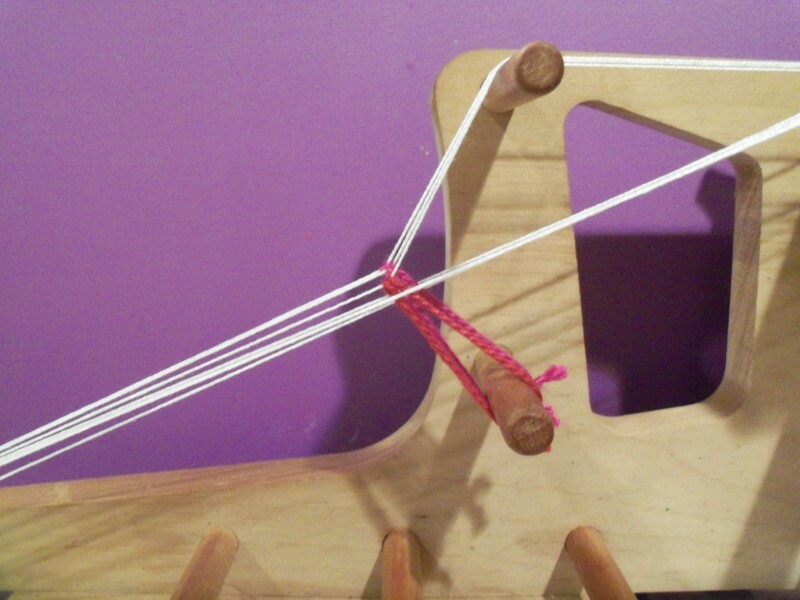 The reason inkle looms have so many pegs (and this is a small one with few pegs, by the way) is so you can warp it different ways for different lengths of band. This one has a maximum warp length of about 60". This is what the short path looks like. 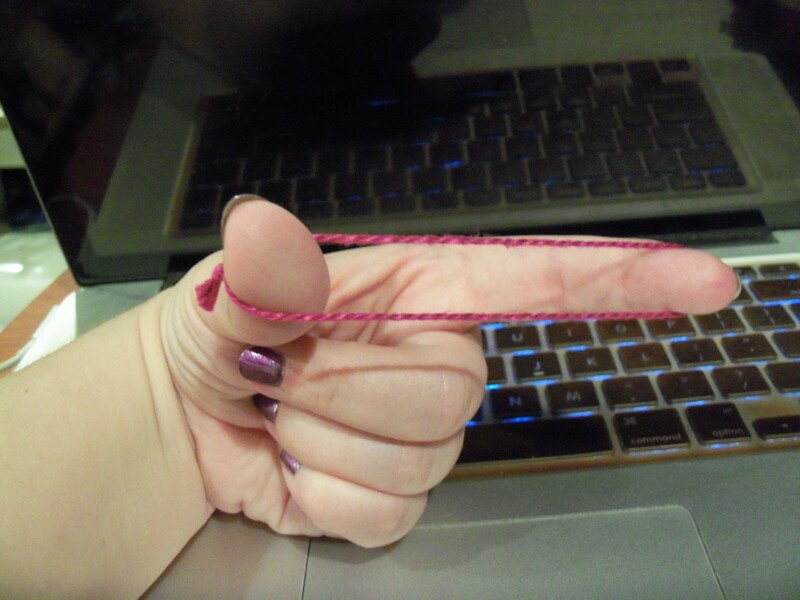 You tie the end of the first string to the bottom front peg using a slip knot or a quick release knot, anything you can untie again relatively easily. 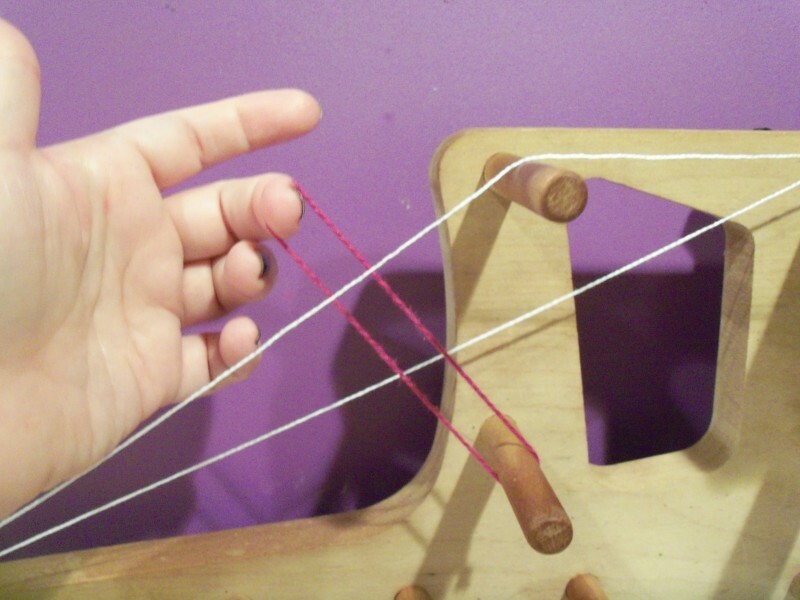 The first thread is an open, unheddled thread, and goes straight to the tension flap or back peg. 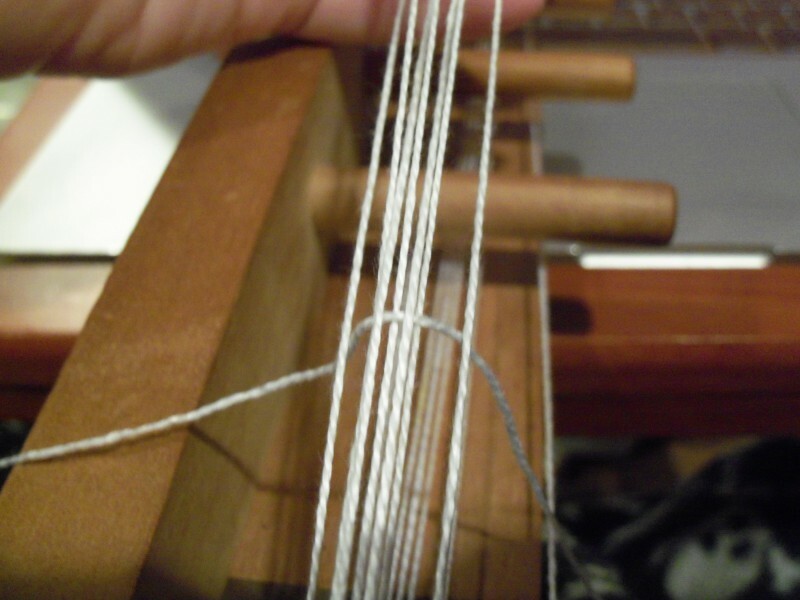 The second thread goes over the top front peg and then gets a string heddle looped from the heddle peg, around it, and back to the heddle peg. 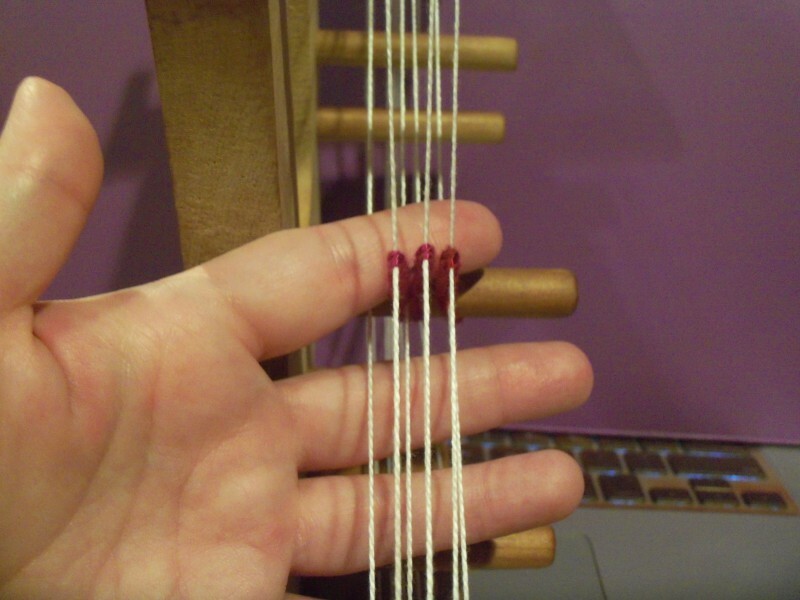 Then you alternate open and heddle strings until you've done all of them. 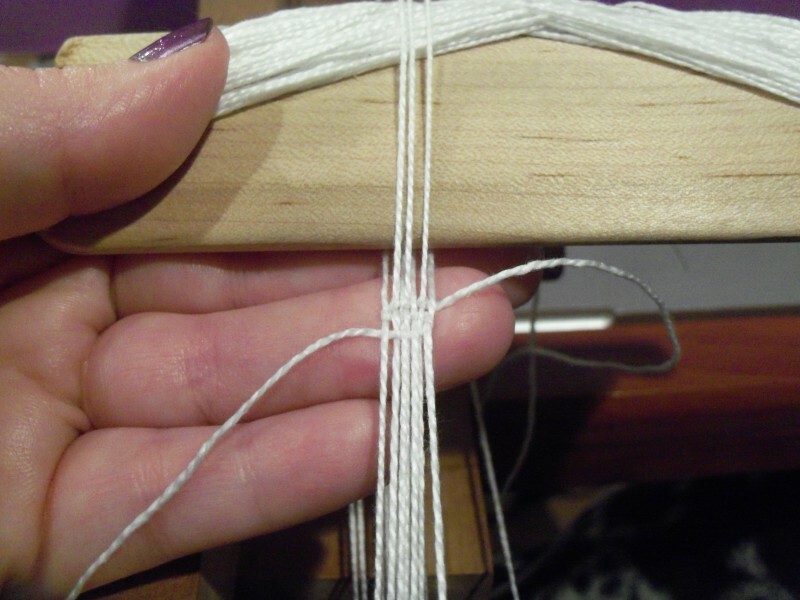 When you're finished warping, untie the end of the first thread and tie it to the end of the last with a square knot. It's important when warping the loom to maintain consistent tension. This is always important, of course. 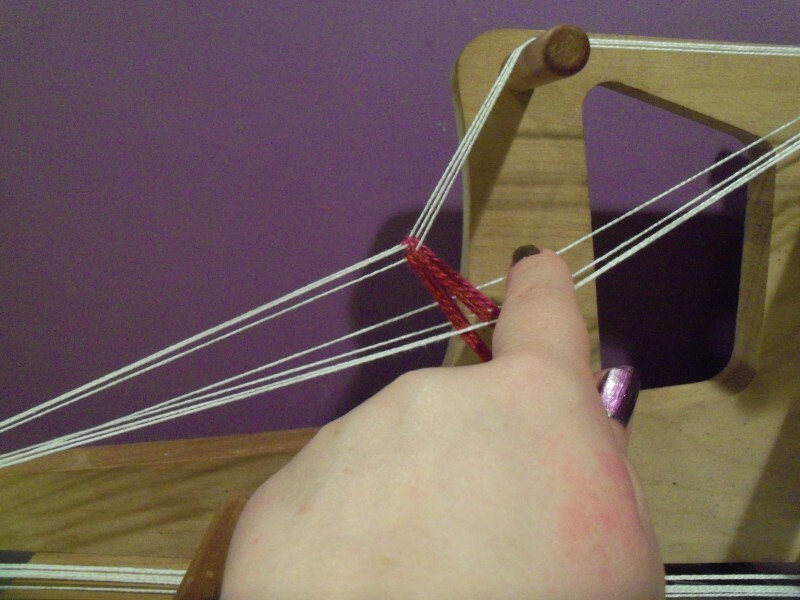 It's actually slightly less crucial here, because an inkle loom takes a continuous warp -- the full path of the entire thing is a circle -- which means you can even out the tension if you make an error. Just have the tension a little loose and pull on all the threads. If anything's much looser than the rest, pull on the tighter threads around it to take up the slack. Then tighten up the tension again. To manipulate the sets of threads, just press down or pull up on the open threads. So that looks like this. You push down on the open threads and pass the shuttle through the shed. After a couple of passes, start tightening it up, pulling the warp threads together. Remember, those are the only ones you want to show really. You may find the first couple of inches a little wobbly starting out. If so, you may want to start with an inch of weaving it a different color to get it straightened out before you start weaving on your project. Just take it out later. And before we wrap up, here's what the long path on my little inklette looks like. That's all for this part. 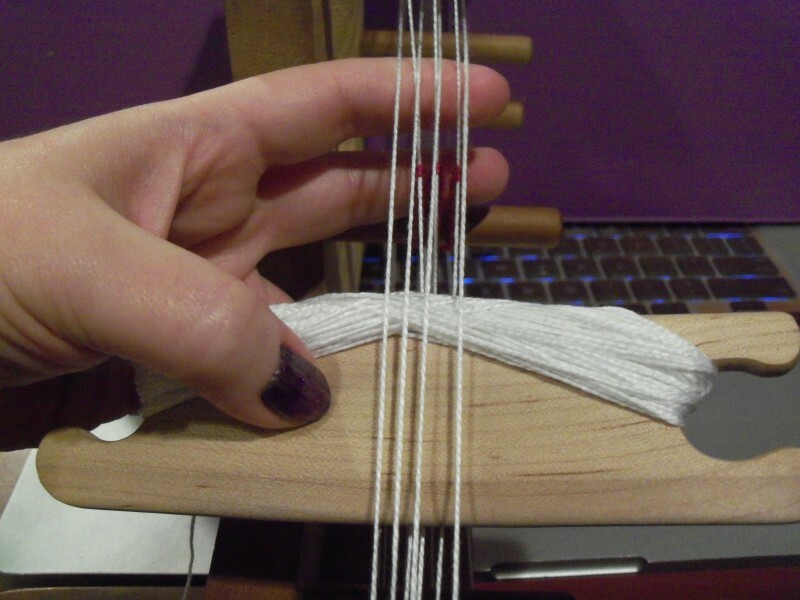 Next up: Actual Baltic Pickup Weaving!